Tyre Yogurt MTB Sealant will not separate, clump or dry out. It contains no latex, or ammonia, is water washable, non toxic & the “Flat Free & Full of Fibre” tech seals up to 8mm holes & cuts in MTB tubeless tyres. There are millions & millions of fibres & fillers permanently suspended in Tyre Yogurt. 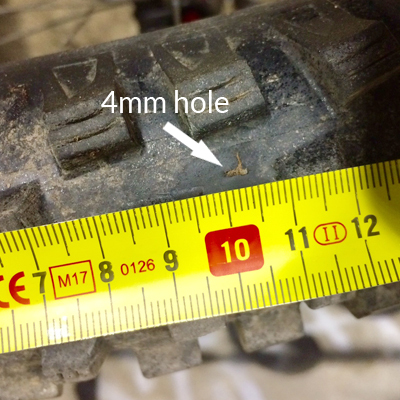 When a puncture occurs, the air in the tyre forces the fibres & fillers into the hole. This forms a flexible plug that prevents further air loss. As the liquid is not part of the sealing process, we do not have to use latex - which can separate and dry out in your tyre. At a similar time in the hills around Saddleworth, England, Matthew’s 12 year old son, Archie, is invited by Jack Reading - One Vision Global Racing, to join the team as a “young ripper”. Jon & Mathew have a conversation about a pending holiday in Morzine &, in passing, Jon mentions his new discovery of a heavy duty, latex & ammonia free tyre sealant. Matt and Archie arrive in Morzine and Jon installs his new sealant in their tyres. A team of riders, scattered across Europe, is recruited to test the product & the sealant is tweaked and re-tested in response to their feedback. As the snow comes to the French Alps & bikes are swapped for skis, testing continues. The product is put through its paces during the cold wet winter months in Saddleworth, Northern England, by a die hard group of riders basing themselves out of the Bikeanics shop. Jon continues to tweak the product and it is re-tested until everyone is happy with the results achieved. “Tyre Yogurt” is officially born, Jon and Matt decide that they are going to embark on a new adventure and take the product to market! With this decision, they then decide that if they are going to go to market with “Tyre Yogurt”, it had to be as perfect as it possibly can be, using only the best raw ingredients available. So they decide to scrap the brilliant Industrial Grade sealant they were using as their original starting point in favour of the even better Military Grade spec sealant. Testing starts all over again. Mountain bikes across Europe and Australia are riding with “Tyre Yogurt” in their tubeless tyres and the first bottles of “Tyre Yogurt” roll off the Bolton production line in June 2018.